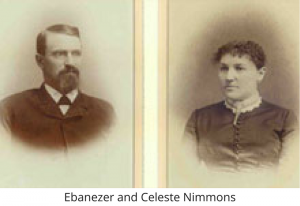 In 1925, Ebenezer and Celeste Nimmons left an estate of $25,000 to the Village of Plainfield for the establishment of a tax-supported public library. Residents voted to create the library later that year. The McClester-Nimmons Free Plainfield Public Library was established on February 1, 1925. The first Board of Directors comprising, Stephen Wolfe, Clyde Wolfe, Grace Jones-Smith and Eugenia Hadlock were appointed May 5, 1925. The original 750 square foot library, located on Lockport Street (Where the Heritage Professional Center is in 2017), opened its doors to the public with an open house on April 30, 1926. Click here to view a construction invoice from 1926. 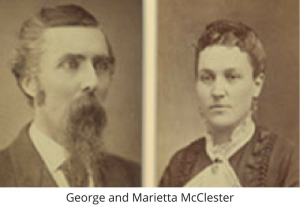 In 1941, a new 2,700 square foot library was built at 705 N. Illinois Street with the proceeds from a bequest from George and Marietta McClester and the remainder of the Nimmons estate. The new Library opened its doors on July 6, 1941. The first Summer Reading Program began May 31, 1948, and over 100 children participated. 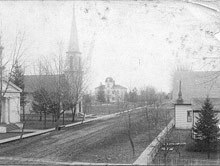 In 1954, the Village Library received a 160-acre farm in a charitable remainder trust from the estate of Fannie Stratton. The library operated the farm for additional revenue for many years. During the 1950s and 1960s, the Plainfield Library worked with Plainfield Schools as a classroom for second grade students. In 1958 the first telephone was installed in the Library. 1966 saw the entry of the Library into the Burr Oak Library System. 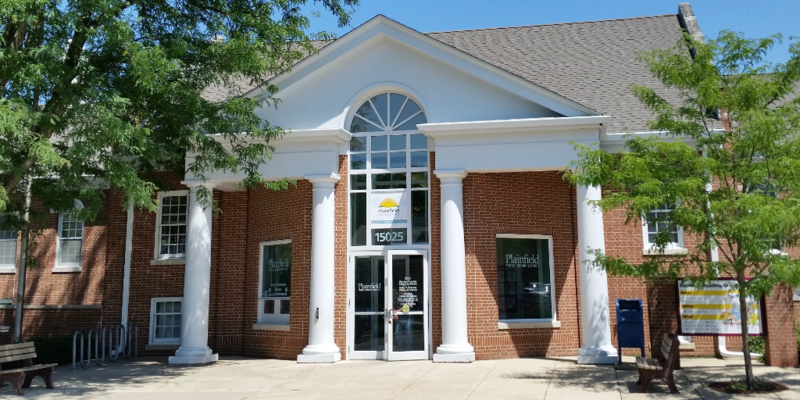 In 1977, Plainfield Township created a tax-supported library to serve residents outside of the Village of Plainfield boundaries. The Plainfield Township Library contracted with other local libraries for service. In 1981, the Township Library opened a 900 square foot library located inside Grande Prairie Elementary School. 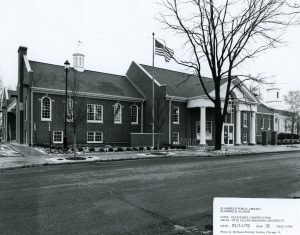 In 1988, voters approved the merger of the McClester-Nimmons Free Plainfield Public Library and Township libraries, becoming the Plainfield Public Library District. The district took effect on July 1, 1988. The temporary Library board was made up of trustees from both the Township board and the McClester-Nimmons board for a total of 13 members. On November 7, 1988, the Library District sold the Stratton farm at public auction for $1,520,000.00. Plans were begun for the construction of a 27,000 square foot facility. The library purchased residences at 707 and 709 N. Illinois Street in preparation for the expansion. Voters rejected the first expansion proposal in 1989. The project was scaled back to finish only 13,500 feet of the 27,000 square foot building in the initial phase. In the meantime, the Library was out of space. The library administrative offices moved to 517 N. Lockport Street in June 1990. The children’s department opened there on November 5th. 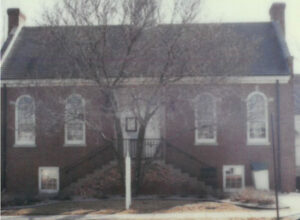 The Library’s administrative offices were moved to 511 N. Lockport in March 1991 until the new library was complete. The Plainfield-Crest Hill-Joliet Tornado destroyed hundreds of homes and businesses causing more than 300 million dollars in damage and claimed 28 lives on August 28, 1990. The Plainfield Public Library branch at Grand Prairie Elementary School was destroyed, luckily no one was injured. Voters approved the second library expansion proposal in November 1990. Construction of the library addition was one of the first projects to begin following the 1990 tornado. A groundbreaking ceremony was held on October 22, 1990. November 1, 1990 saw the demolition of the two homes adjacent to the library at 705 and 707 Illinois St. The new facility, designed by the firm Frye, Gillian and Molinaro, opened its doors on December 8, 1991. The Plainfield Public Library District employed 9 full-time and 15 part-time staff. The Library served fewer than 15,000 people at this time and about 108,000 items were checked out in 1992. 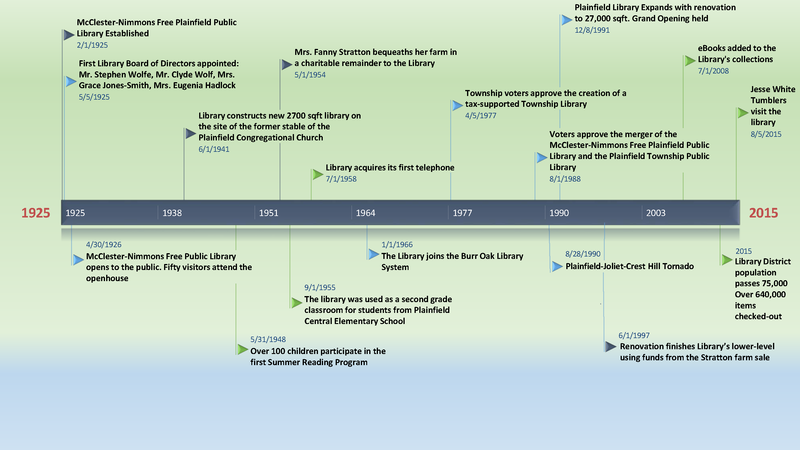 The Friends of the Plainfield Public Library held their first meeting on January 8, 1992. In 1993, the Village of Plainfield and the Library made an intergovernmental agreement requiring areas annexing to the Village to also annex to the library district if the area did not have library service. As a result of the failed operating tax increase, the library cut service hours, eliminated staff positions, and froze the book budget in 1994. Over the next several years, the burgeoning residential building boom in the community allowed the restoration of these services. In 1997, the lower level was completed using the remainder of the proceeds of the Stratton Farm. That year, the Village completed another intergovernmental agreement allowing the library to collect fees from developers annexing land to the Village. In 2000, the population of the Library District was estimated to be about 40,000 people and over 180,000 items were checked out. In 2015, the population of the district rose to over 75,000 with 640,000 items checked out. The world-renowned Jesse White Tumblers came to the Library to film a Public Service Announcement for the Illinois Summer Reading Program on August 5, 2015. Click here to view a timeline of the Library’s history.